Hernán Cortés, excited by stories of the lands which Columbus had recently discovered, sailed from Spain in 1505 landing in Hispaniola which is now Santo Domingo. After farming there for some years he sailed with Velázquez to conquer Cuba in 1511. He was twice elected major of Santiago then, on 18 February 1519, he sailed for the coast of Yucatán with a force of 11 ships, 508 soldiers, 100 sailors, and 16 horses. He landed at Tabasco on the northern coast of the Yucatán peninsular. He met with little resistance from the local population and they presented him with presents including twenty girls. He married Malinche, one of these girls. The people of the Yucatán peninsular were descendants of the ancient Mayan civilisation which had been in decline from about 900 AD. It is the mathematical achievements of this civilisation which we are concerned with in this article. However, before describing these, we should note that Cortés went on to conquer the Aztec peoples of Mexico. He captured Tenochtitlán before the end of 1519 (the city was rebuilt as Mexico City in 1521) and the Aztec empire fell to Cortés before the end of 1521. Malinche, who acted as interpreter for Cortés, played an important role in his ventures. In order to understand how knowledge of the Mayan people has reached us we must consider another Spanish character in this story, namely Diego de Landa. He joined the Franciscan Order in 1541 when about 17 years old and requested that he be sent to the New World as a missionary. Landa helped the Mayan peoples in the Yucatán peninsular and generally tried his best to protect them from their new Spanish masters. He visited the ruins of the great cities of the Mayan civilisation and learnt from the people about their customs and history. However, despite being sympathetic to the Mayan people, Landa abhorred their religious practices. To the devote Christian that Landa was, the Mayan religion with its icons and the Mayan texts written in hieroglyphics appeared like the work of the devil. He ordered all Mayan idols be destroyed and all Mayan books be burned. Landa seems to have been surprised at the distress this caused the Mayans. Nobody can quite understand Landa's feelings but perhaps he regretted his actions or perhaps he tried to justify them. Certainly what he then did was to write a book Relación de las cosas de Yucatán Ⓣ (1566) which describes the hieroglyphics, customs, temples, religious practices and history of the Mayans which his own actions had done so much to eradicate. The book was lost for many years but rediscovered in Madrid three hundred years later in 1869. 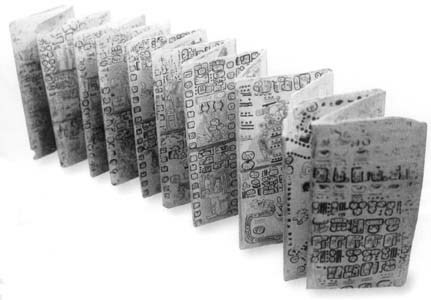 A small number of Mayan documents survived destruction by Landa. The most important are: the Dresden Codex now kept in the Sächsische Landesbibliothek Dresden; the Madrid Codex now kept in the American Museum in Madrid; and the Paris Codex now in the Bibliothèque nationale in Paris. The Dresden Codex is a treatise on astronomy, thought to have been copied in the eleventh century AD from an original document dating from the seventh or eighth centuries AD. Knowledge of the Mayan civilisation has been greatly increased in the last thirty years (see for example  and ). Modern techniques such as high resolution radar images, aerial photography and satellite images have changed conceptions of the Maya civilisation. We are interested in the Classic Period of the Maya which spans the period 250 AD to 900 AD, but this classic period was built on top of a civilisation which had lived in the region from about 2000 BC. The Maya of the Classic Period built large cities, around fifteen have been identified in the Yucatán peninsular, with recent estimates of the population of the city of Tikal in the Southern Lowlands being around 50000 at its peak. Tikal is probably the largest of the cities and recent studies have identified about 3000 separate constructions including temples, palaces, shrines, wood and thatch houses, terraces, causeways, plazas and huge reservoirs for storing rainwater. The rulers were astronomer priests who lived in the cities who controlled the people with their religious instructions. Farming with sophisticated raised fields and irrigation systems provided the food to support the population. A common culture, calendar, and mythology held the civilisation together and astronomy played an important part in the religion which underlay the whole life of the people. Of course astronomy and calendar calculations require mathematics and indeed the Maya constructed a very sophisticated number system. We do not know the date of these mathematical achievements but it seems certain that when the system was devised it contained features which were more advanced than any other in the world at the time. The Maya number system was a base twenty system. Here are the Mayan numerals. Almost certainly the reason for base 20 arose from ancient people who counted on both their fingers and their toes. Although it was a base 20 system, called a vigesimal system, one can see how five plays a major role, again clearly relating to five fingers and toes. In fact it is worth noting that although the system is base 20 it only has three number symbols (perhaps the unit symbol arising from a pebble and the line symbol from a stick used in counting). Often people say how impossible it would be to have a number system to a large base since it would involve remembering so many special symbols. This shows how people are conditioned by the system they use and can only see variants of the number system in close analogy with the one with which they are familiar. Surprising and advanced features of the Mayan number system are the zero, denoted by a shell for reasons we cannot explain, and the positional nature of the system. However, the system was not a truly positional system as we shall now explain. Both these examples are found in the ruins of Mayan towns and we shall explain their significance below. Even though no trace of it remains, we can reasonably assume that the Maya had a number system of this kind, and that intermediate numbers were figured by repeating the signs as many times as was needed. Let us say a little about the Maya calendar before returning to their number systems, for the calendar was behind the structure of the number system. Of course, there was also an influence in the other direction, and the base of the number system 20 played a major role in the structure of the calendar. The Maya had two calendars. One of these was a ritual calendar, known as the Tzolkin, composed of 260 days. It contained 13 "months" of 20 days each, the months being named after 13 gods while the twenty days were numbered from 0 to 19. The second calendar was a 365-day civil calendar called the Haab. This calendar consisted of 18 months, named after agricultural or religious events, each with 20 days (again numbered 0 to 19) and a short "month" of only 5 days that was called the Wayeb. The Wayeb was considered an unlucky period and Landa wrote in his classic text that the Maya did not wash, comb their hair or do any hard work during these five days. Anyone born during these days would have bad luck and remain poor and unhappy all their lives. Why then was the ritual calendar based on 260 days? This is a question to which we have no satisfactory answer. One suggestion is that since the Maya lived in the tropics the sun was directly overhead twice every year. Perhaps they measured 260 days and 105 days as the successive periods between the sun being directly overhead (the fact that this is true for the Yucatán peninsular cannot be taken to prove this theory). A second theory is that the Maya had 13 gods of the "upper world", and 20 was the number of a man, so giving each god a 20 day month gave a ritual calendar of 260 days. At any rate having two calendars, one with 260 days and the other with 365 days, meant that the two would calendars would return to the same cycle after lcm(260, 365) = 18980 days. Now this is after 52 civil years (or 73 ritual years) and indeed the Maya had a sacred cycle consisting of 52 years. Another major player in the calendar was the planet Venus. The Mayan astronomers calculated its synodic period (after which it has returned to the same position) as 584 days. Now after only two of the 52 years cycles Venus will have made 65 revolutions and also be back to the same position. This remarkable coincidence would have meant great celebrations by the Maya every 104 years. Now there was a third way that the Mayan people had of measuring time which was not strictly a calendar. It was an absolute timescale which was based on a creation date and time was measured forward from this. What date was the Mayan creation date? The date most often taken is 12 August 3113 BC but we should say straightaway that not all historians agree that this was the zero of this so-called "Long Count". Now one might expect that this measurement of time would either give the number of ritual calendar years since creation or the number of civil calendar years since creation. However it does neither. which is 1253912 days from the creation date of 12 August 3113 BC so the plate was carved in 320 AD. which is 1357100 days from the creation date of 12 August 3113 BC so the building was completed in 603 AD. [ 9;8;9;13 ] = 13 + 9 × 20 + 8 × 18 × 20 + 9 × 18 × 202 = 67873. Moving all the numbers one place left would multiply the number by 20 in a true base 20 positional system yet 20 × 67873 = 1357460 which is not equal to 1357100. For when we multiple [ 9;8;9;13 ] by 20 we get 9 × 400 where in [ 9;8;9;13;0 ] we have 9 × 360. We should also note that the Mayans almost certainly did not have methods of multiplication for their numbers and definitely did not use division of numbers. Yet the Mayan number system is certainly capable of being used for the operations of multiplication and division as the authors of  demonstrate. The Mayan concern for understanding the cycles of celestial bodies, particularly the Sun, the Moon and Venus, led them to accumulate a large set of highly accurate observations. An important aspect of their cosmology was the search for major cycles, in which the position of several objects repeated. The Mayans carried out astronomical measurements with remarkable accuracy yet they had no instruments other than sticks. They used two sticks in the form of a cross, viewing astronomical objects through the right angle formed by the sticks. 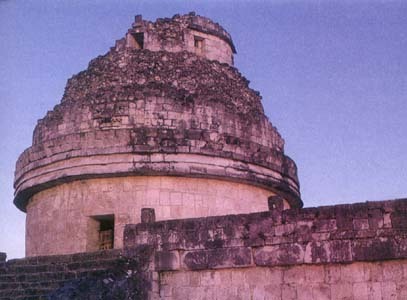 The Caracol building in Chichén Itza is thought by many to be a Mayan observatory. Many of the windows of the building are positioned to line up with significant lines of sight such as that of the setting sun on the spring equinox of 21 March and also certain lines of sight relating to the moon. With such crude instruments the Maya were able to calculate the length of the year to be 365.242 days (the modern value is 365.242198 days). Two further remarkable calculations are of the length of the lunar month. At Copán (now on the border between Honduras and Guatemala) the Mayan astronomers found that 149 lunar months lasted 4400 days. This gives 29.5302 days as the length of the lunar month. At Palenque in Tabasco they calculated that 81 lunar months lasted 2392 days. This gives 29.5308 days as the length of the lunar month. The modern value is 29.53059 days. Was this not a remarkable achievement? There are, however, very few other mathematical achievements of the Maya. Groemer  describes seven types of frieze ornaments occurring on Mayan buildings from the period 600 AD to 900 AD in the Puuc region of the Yucatán. This area includes the ruins at Kabah and Labna. Groemer gives twenty-five illustrations of friezes which show Mayan inventiveness and geometric intuition in such architectural decorations.